"Rather, a person is a Jew who is one inwardly, and real circumcision is a matter of the heart—it is spiritual and not literal. Such a person receives praise not from others but from God." During lectio divina, the phrase that resonated was "a matter of the heart". One is usually passionate about a matter of the heart. The phrase also evokes emotional responses. I did wonder if the Greek had been mistranslated, as so often "heart" is substituted for "gut". A matter of the gut, where instinct and intuition dwells. Today we talk about having a gut feeling. It's kind of primal, visceral. If gut is what is really meant, the "real circumcision" Paul talks of is that the Way of God has taken residence deep in our being, within our cells. It means we respond to the world instinctively with God's love and compassion rather than with the mind working out the law. And yes, I'm aware of the irony that I just used my brain to figure that out! I am continuing to find it difficult to stop the brain chatter and listen for God during these lectio divina sessions. I am more likely to wander off down a mental pathway, whether it's a song or a work issue. But I keep at it because just this time spent in the presence of God is worth it. And maybe one day I'll get out of my head and into my gut/heart. 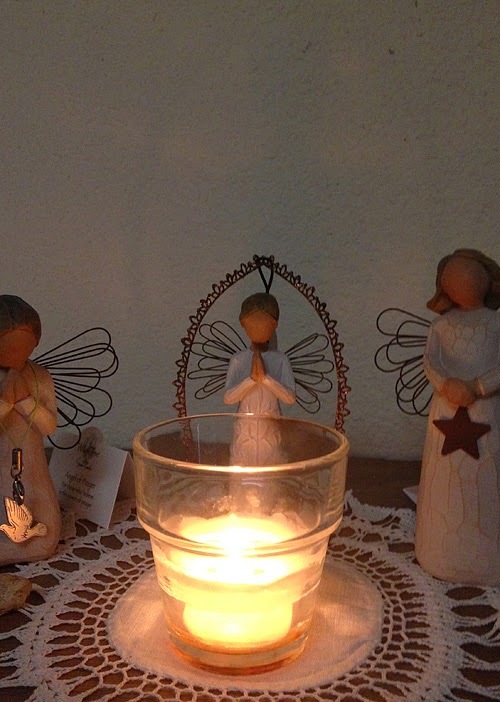 I should really take a photo of my candlelit angels at night, rather than morning.